Domingo Martínez was born in Seville in the last third of the 17th century, probably around 1688, as according to the Conde del Águila, and died in 1749 at the age of 611. Martínez first trained with Alonso Miguel de Tobar (1678-1748) and primarily in the workshop of the little known Juan Antonio Ossorio and Lucas Valdés (1661-1725). Martínez’s style is, however, directly indebted to that of Bartolomé Esteban Murillo (1617-1682), which made him the most highly prized and important painter in Seville in the first half of the 18th century. Due to this fact and to his extreme diligence, Martínez soon established a studio in his house where he took on numerous pupils, notably Juan de Espinal, Andrés Rubira and Pedro de Tortolero, to whom he would pass on his painterly skills using an up to date approach2. Martínez’s artistic career began in 1717 when he was commissioned together with Gregorio Espinal to decorate the Chapel of the Sacrament in San Lorenzo. The artist soon enjoyed professional success due to the protection of the Archbishop of Seville, Luis de Salcedo y Azcona, who commissioned numerous works from him. Between 1729 and 1733 Philip V and Isabella Farnese based the Court in Seville and Martínez enjoyed a particularly flourishing period in his career, establishing contacts with the French painters Louis-Michel van Loo and Jean Ranc. He became good friends with the latter, and was also employed by the Queen to find works of art, primarily paintings by Murillo. Martínez’s close association with Ranc also became evident in his work, which started to reveal the influence of French painting. His chromatic range moved away from earth tones and became lighter and cooler while his compositions became more refined and elegant. In 1733, as the Court was about to leave Seville, Ranc proposed that Martínez be appointed royal painter, but the latter did not accept as: “he was not in financial need nor did he lack works to paint, for which reason he preferred the tranquility of his own home”, according to Ceán Bermúdez3. Martínez’s later period was an intensively active one, for which reason he employed a large number of assistants, a situation that on occasions negatively affected the quality of his work. The last major commission that he undertook was the series of eight canvases painted in 1748 that depict the large-scale mascarade held in Seville in June 1747 to celebrate the ascent to the throne of Ferdinand VI and Bárbara de Braganza. Martínez died in 1749, as recorded in his death certificate in the parish church of San Lorenzo in Seville4. Martínez was particularly noted as a mural painter, following the late 17th century tradition developed by Juan Valdés Leal and his son Lucas Valdés, and he would be the leading representative within this field in the first half of the 18th century5. Martínez’s mural paintings generally continue the subject matter of the altarpiece in the church in question, depiction a series of celestial and allegorical visions characteristic of Andalusian Baroque painting at its most exuberant peak. These visions consist of trompe l’oeil architectural settings and plaster surrounds; celestial spaces that extend infinitely in space; and floral garlands. Within these purely decorative elements the artist located angels and religious and allegorical scenes. The result was to create grand, theatrical compositions that achieved exceptionally dramatic and rich effects, and on occasions Martínez made use of Andrea del Pozzo’s book Perspectiva pictorum et architectorum (1693-1698) as a source for these fictive, painted spaces. The present drawing is an extremely good example of the above-mentioned stylistic characteristics and may be a design for one of Martínez’s mural decorations. It depicts an Allegory of Charity, depicted in black chalk and grey-brown wash6. Charity is one of the Three Theological Virtues, along with Faith and Hope, and is thus a common motif in church iconography. The typically Baroque composition has the allegorical figure as its central axis as well as a series of rising, decorative elements such as small angels, garlands, flower vases, plinths and cartouches that together create a sense of profuse, undulating decoration. The pyramidal composition terminates with a lobed cornice that imitates rocaille decoration as found in gesso work and in Andalusian Baroque altarpieces. A decorative framework of this type, of which only half is depicted (on the assumption that the other, symmetrical half would have been identical), would have been designed to house a religious scene or figure. 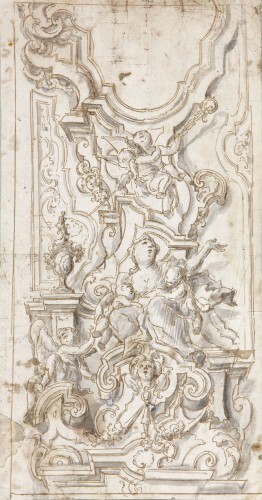 This type of decorative design is notably comparable to that found in other works by the artist such as the sanctuary of the Hospital de la Misericordia in Seville. There, angels depicted in bold foreshortening are set in lobed frames. Another comparable decorative scheme is that in the church of Saint Louis of the French, in which trompe l’oeil architectural structures and gesso work are combined with garlands, angels, etc. The particularly long, narrow format of the drawing, the pronounced shadowing used to model the volumes and the markedly “di sotto in sù” perspective indicate that this preliminary sketch was designed for the crossbeam of a ceiling or the soffit of an arch in a church. If we visually recreate the other, absent half of the frame, this becomes perfectly clear. Although this sheet cannot be related to any known mural decoration undertaken by Domingo Martínez in Seville, it seems more than likely that it was produced in connection with a commission for a decorative scheme that has not survived or was ultimately not carried out. Soro Cañas, Salud, Domingo Martínez. Sevilla, Arte Hispalense, 1982, p. 17. Ceán Bermúdez, J. Agustín, Diccionario Histórico de los más ilustres profesores de las Bellas Artes en España. Madrid, en la imprenta de la viuda de Ibarra, 1800, vol. III, pp. 73-76. Ceán Bermúdez, J. Agustín, Diccionario Histórico de los más ilustres profesores de las Bellas Artes en España. Madrid, en la imprenta de la viuda de Ibarra, 1800, vol. III, p. 73. Soro Cañas, Salud, Domingo Martínez. Sevilla, Arte Hispalense, 1982, p. 20. For in-depth information on this aspect of the artist’s work, see Fernández López, José, “La pintura mural de Domingo Martínez” in Exhibition Domingo Martínez en la estela de Murillo. Sevilla, Centro Cultural El Monte, 2004, pp. 57-73. First published in Quiles, Fernando and Cano, Ignacio, Bernardo Lorente Germán y la pintura sevillana de su tiempo (1680-1759). Madrid, Fernando Villaverde Ediciones, 2006, p. 83, although not mentioned in the text.ive scheme that has not survived or was ultimately not carried out.